← Groups are officially live! Something I’ve been asking myself lately is this how many of Protagonize‘s 7,100+ authors are actually part of a real-world writing group. My semi-educated guess, based on membership demographics, is that there’s a small percentage of you who do belong to physical author groups, meeting up on a regular basis with your cohorts to discuss your latest preferences in the literary arena and work on further refining your writing chops. If you do happen to belong to a writing group outside of Protagonize, be it an online forum or a real-life meetup with like-minded individuals, I’d like to hear about it. Better yet, I’m looking for writing groups who would be interested in hosting their online presence and discussion within Protagonize’s Groups area. If you or someone you know has any interest in participating, whether their writing group is public or private, I’ll do my best to accommodate you and listen to your feedback. Please feel free to get in touch with me directly if you’re interested, no matter where you’re based or how large or small your group might be. I’d be happy to set you up with a group of your own to try out for your members. Photo courtesy of AEngineer on Flickr. This entry was posted in authors, Collaborative writing, General, Miscellaneous and tagged feedback, groups, real-world, research, writing, writing circles. Bookmark the permalink. 12 Responses to Are you part of a real-world writing group? I want to join a reading group in my local library but it costs too much =( That’s why I’m on Protag so much. 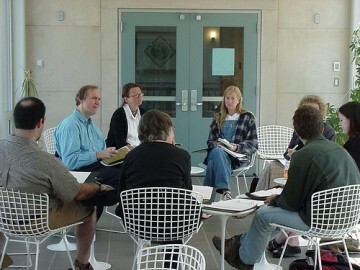 It costs money to join a writer’s group in a library. Ugh. I belong to a real world writing group. It’s free, sorta (we meet in a pub so we each of us pay a small amount for the room hire). Can’t believe you have to pay to join a library-based group! That’s bad. Not sure if the pub has internet Nick so I’d have to ask about that, and also the rest of the group, if they’d want to be part of an online meet. I have told them all about this site, but if any of them have joined they have kept it under their hats. They mostly are very oriented to publishing their work, but not really online. I don’t think any of them have posted stories on any site. My group is a genre-specific group weirdly. It’s Sci-fi and fantasy and grew out of a reading group in this genre, which was started by these two girls who met when they worked in a bookshop together. I don’t wish I did. This could of course work the opposite way around. if people off of protagonize created numerous writing groups around the world, we could meet up, depending on location and do some writing group stuff, this would also give us the chance to promote protagonize to members of the public that haven’t heard of protagonize. I go to a writing club for teenagers my age and though it’s only on once a month, I still get a lot out of it. It keeps me motivated and helps me to improve my writing skills. I love it! (By the way, it’s free). How about a school run literary magazine? Could that count as a writing group? I know some of the people who submit to it could definitely use a bit of help with their writing. Our faculty members are accomplished writers and poets who work closely with you to deepen reading and writing abilities and to enhance self and peer editing, analysis, and critical thinking skills. My liberal arts college has a writing major too (which I am in)! I don’t think they are so intense about it, though. I’m actually thinking of starting a little writing group with other students at my college who are serious about their writing. I don’t know if we’d want an online group… but I’ll definitely let you know if we do, nick. I belong to 3 writing groups in Vancouver. One is the West End Writer’s Workshop, the other two are with people that I have met through courses or friends. Getting feedback on writing and just chatting in person with other writers (it can be a pretty solitary activity but since Protagonize came around, not so much!) is very inspiring and it’s pretty easy and cheap to set up your own group. I’m part of one that was really fairly impromptu. A friend from my English class and I found ourselves staying after school and discussing our writing with, interestingly enough, our physics teacher. Since this became a regular-basis thing our teacher proclaimed us The Fellowship.